Buy Orgran Gluten Free, Egg Free, Dairy Free, Vegan Licorice - 200g in the UK from our online shop or directly from our independent Scottish store. This gluten free, dairy free and vegan licorice (liquorice) is tasty and superb as a snack for people who want to enjoy their licorice but can't or won't eat gluten. Molasses (58%), Tapioca Starch, Sugar, Soy Flour (GMO Free), Water, Corn Glucose Syrup, Palm Vegetable Oil, Aniseed Oil, Licorice Powder (0.5%), Emulsifier: Vegetable Derived Monoglycerides. Preservative: Ascorbic Acid. Vegetable Gums (Stabilisers): Xanthan Gum, Guar Gum. We sell real Orgran and other Licorice directly from our shop in Scotland and online throughout the UK. Where can you buy real Gluten Free Licorice safely online? If you are wondering where you can buy Orgran Gluten Free, Egg Free, Dairy Free, Vegan Licorice - 200g safely online in the UK, then shop with us. 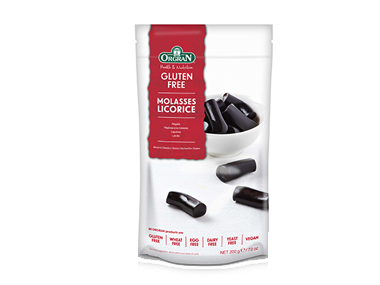 Gluten Free Licorice - Orgran Gluten Free, Egg Free, Dairy Free, Vegan Licorice - 200g in Licorice and Confectionery.